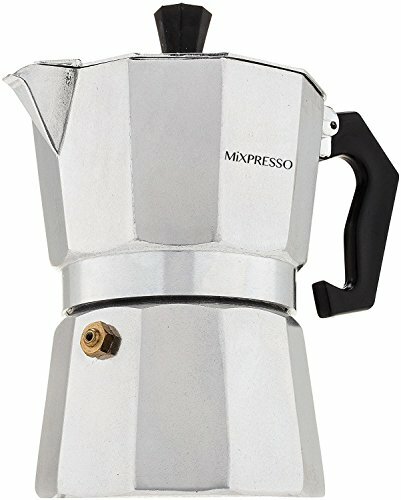 View More In Stovetop Espresso & Moka Pots. Make great coffee with a Moka Pot! These are underrated and they do delicious things. They make a coffee that is half-way between espresso and drip coffee. They had a bad reputation for making bitter coffee but with a few simple steps below, you can make something super delicious. Moka Pot Tips: Always make sure your Moka Pot is clean and you will not get bitter coffee. Filling the pot with hot water before you put it onto the stove also helps avoid bitter coffee. Grind size for your coffee matters...you dont want something super fine like for espresso but rather you want something a bit coarser. With the ground coffee, fill the Moka Pot's coffee holder but dont press it down. Learn how to use a Moka Pot with Chef Step's Moka Pot AMAZING video on youtube. ATTRACT EVERYONE TO YOUR KITCHEN: Designed to heat quickly and evenly, this stovetop savior helps you create the most delectable hot beverages. Fill your home with the rich, smooth aromas of your favorite brew, in any style you like to drink it. BRING WARMTH TO ANY STOVETOP OR TABLE: Some distract with busy graphics or finishings that can't take the heat. Mixpresso's true Italian minimalist design and classic aluminum finishing lets you focus on the delicious cup in front of you. THE PERFECT SIZE: Makes up to 3 demitasse (2 oz.) cups on any gas or electric stovetop-enough for a warm breakfast in bed or a midnight nightcap with friends. 1-YEAR GUARANTEE: You bought our espresso and mocha maker to provide the perfect "wake-up", morning, noon or night. Mixpresso guarantees its products work perfectly so our customers can breathe easy. If you have any questions about this product by Mixpresso, contact us by completing and submitting the form below. If you are looking for a specif part number, please include it with your message.